There are 7 main energy centres in our body called ‘Chakra’s’ (pronounced CHA-kra). The seventh chakra centre is known as our Crown Chakra located at the top of our head. The seventh chakra aligns us with our internal higher powers. The higher consciousness of the crown chakra transcends the regional values of the lower energy centres in our esoteric body and helps us to move beyond the tribal and earthbound way of thinking. The seventh energy centre has the potential to help us become free from fear and allow us to see our unlimited potential. The more spiritually aware we become the stronger our Crown Chakra energy grows. Strong and powerful spiritual energy motivates us to towards a deeper connection to our Soul and less with our ego mind. The process of consciousness is available to all human beings, and yet there are so many humans that turn a blind eye to this process. Their deep ancestral beliefs hold them tightly to their behaviours with the utmost confidence that what they believe and accept is the truth of ‘life’. Many do not venture away from the walls or foundation which binds them to what they presume is the way to live. 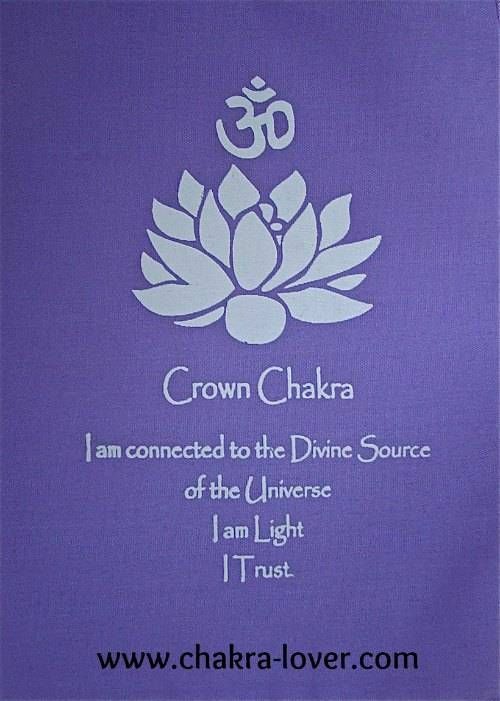 The Crown Chakra is a direct link to the most powerful guidance we will ever need while we are here in this life experience. The seventh energy centre provides us with the umbilical cord to our Higher Power and our Guardian Spirits, these energies are constantly, without fault, waiting to assist us in transcending beyond our earthly beliefs into the spiritual realms, also know as the holy, outer-worldly, pure, sacred and incorporeal, and that which is nonphysical. When you agree to open the connection to the Divine with your Crown Chakra energy you are gifted with symbolic sight. This new vision now allows you to see the bigger picture of the whole of who you are. This new power of seeing connects you to the answers of the biggest question we all ask of our self, ‘why did this happen to me’? When you open your heart to the mystic energies of your Soul you open your life to so much more than what it is already, you open your mind and heart to the true essence of yourself, the person you are underneath your conditioning and all of the messages you have received to recite to you who you are supposed to be.